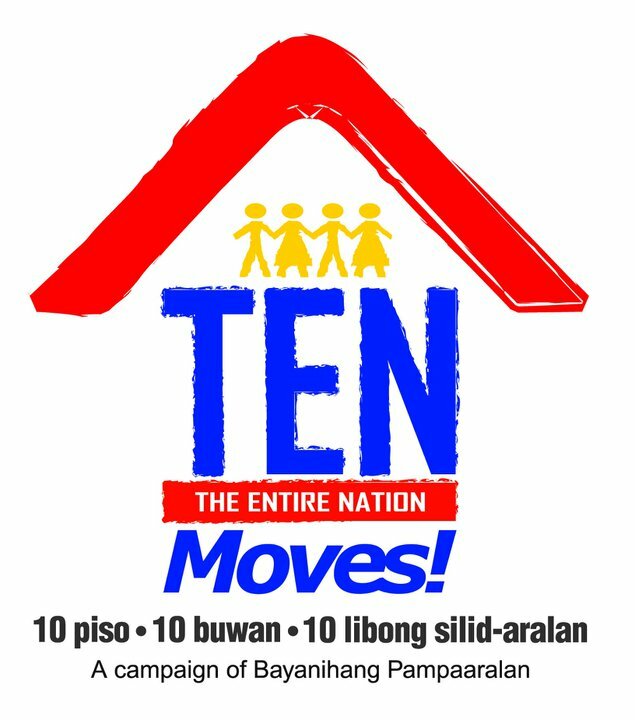 General Santos City is the latest local government that adopted The Entire Nation (TEN) Moves campaign to address the lack of classrooms in the country. The launching was held yesterday, March 19, 2013 at General Santos City National High School. It was attended by corporations, universities, local government, youth groups, students, teachers and NGO's coming from all over from the region. TEN Moves! campaign aims to get two million Filipinos to donate P10 a day for a year to build 10,000 classrooms. Also present during the launching and encouraged everyone to support TEN Moves! campaign were Mr. Diosdado Ablanido, DepEd Gensan Division Superintendent, Archimedes Velasco, Operations Manager for Mindanao of Ayala Foundation Inc., City Councilor Margareth Santos, Mr. Kazumasa Sakakura, Corporate Division Manager of Mitsubishi Corporation and Ayala Young Leaders Alumni Association members from Region 12. Local businesses and groups such as KCC Mall, Brigada Media, the Rotary Club, the SK Federation, Pacquiao Group of Companies, Sagittarius Mines Inc., MSU Gensan- College of Law, ICAN Foundation International, and the Fil-Chinese Chamber of Commerce have also pledged their support for the project. Since its launch to the public in October 2011, TEN Moves! have already built 1,277 classrooms under the Bayanihang Pampaaralan, it's mother campaign. Around 49 million has been raised in cash and through donations or pledges. The campaign's beneficiaries include communities in Benguet, Batangas, Palawan and Sulu. It also aims to raise funds for the schools affected by Typhoon Pablo. 10 pesos a day for 10 months. Help build 10,000 classrooms. To learn more about TEN Moves, visit www.tenmoves.org or send an email to info@tenmoves.org .